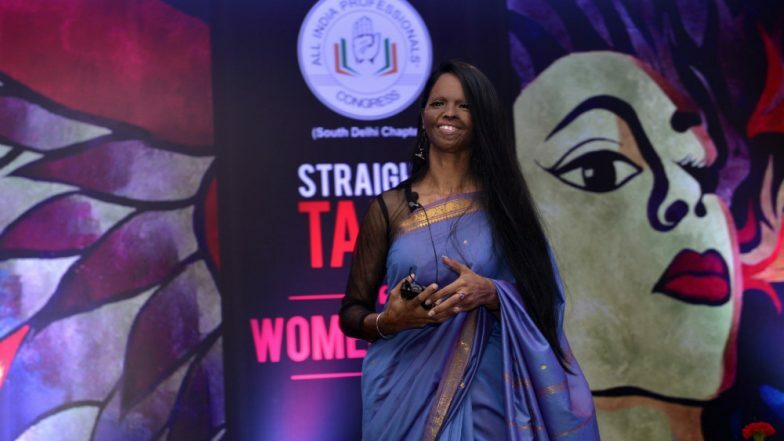 New Delhi, March 30: Acid attack survivor Laxmi Agarwal says her strength and courage define her beauty. Laxmi was here at the India Runway Week season 11 on Friday, where she was seen walking the runway for designer Laxmi Shriali Sood, who showcased a range titled 'Revolutionary Goddess'. She sauntered the ramp in an intricately embellished printed silk lehenga with a sheer organza overlaying crop jacket. Chhapaak First Look: Who is Laxmi Agarwal, The Acid-Attack Survivor Played by Deepika Padukone? Talking about the message she wants to send out by walking the ramp, Laxmi told IANS: "There have been several shows where people (suffering from ordeals have walked). Today, I am walking for Laxmi Shriali Sood... Whatever she is showcasing today is for a cause. "They have changed the fact that what is more important -- appearance or strength... I feel if only outer beauty was important I wouldn't have walked the ramp today. My strength and my courage is my beauty." Deepika Padukone’s Acid Attack Survivor Look From 'Chhapaak' Unveiled. Asked if she gets nervous while walking on the ramp, she said: "I don't feel nervous at all. I see people in the backstage and they are nervous about how the show would go. I feel 'Darr ke aage jeet hai'. There is no nervousness or anxiety before walking on the ramp." Laxmi's life story will soon find its way onto the silver screen with "Chhapaak". Actress Deepika Padukone will be seen playing the role of Laxmi in the film, which will be helmed by Meghna Gulzar. A Fox Star Hindi project, the film also stars Vikrant Massey.